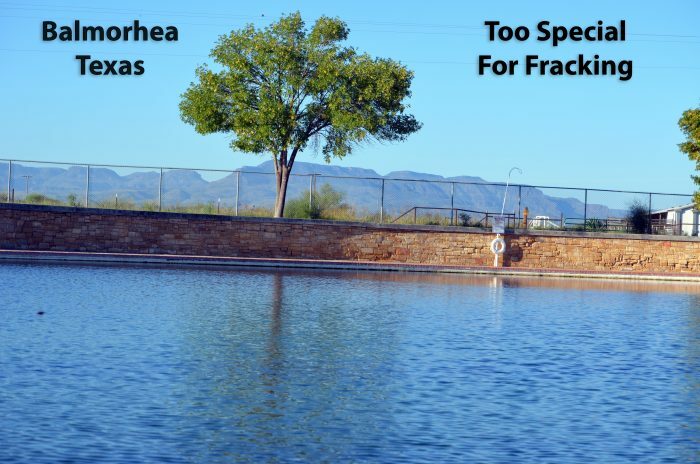 Do not trust Apache Corp to frack near Balmorhea, Texas and the Spring System. “We will do what is right for the [Balmorhea] community and often that is the right answer for us as well,” Apache vice president Gary Clark says. 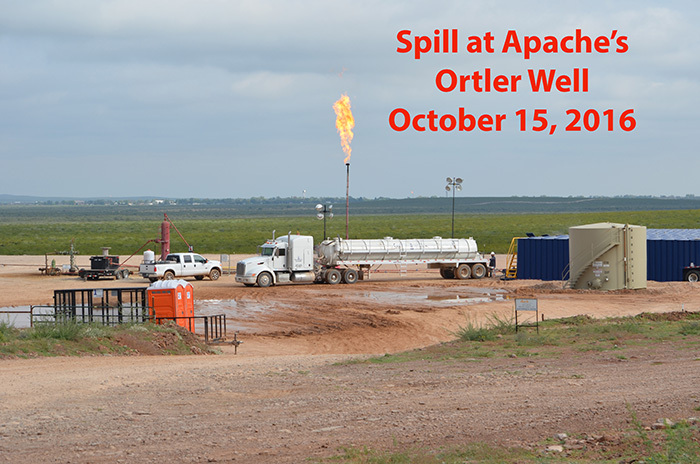 The photo shows a spill on Apache Corp’s Ortler Well pad site which is only 2 miles from Balmorhea State Park and San Solomon Spring (VIDEO). It appears the spill originated from the round, tan tank with the danger signs. There was a strong petroleum odor with a rotten egg smell st the site. The blue tanks were venting VOCs from flowback fluid or waste water into the air. This is not best practice. Gas busters that incinerate the VOCs are available for flowback tanks. The flow at San Solomon Spring increases “soon after a significant rainfall” which means there are shallow recharge zones in the area. According to Dr. Jack Sharp, University of Texas, Austin hydrogeologist, these recharge zones should be identified and excluded before fracking starts. Apache Corp is already spilling before identifying the recharge zones. A spill such as the one shown above, could quickly contaminate the spring. Balmorhea is a rare desert oasis and special place, for global tourists. Balmorhea is too precious to risk. Do not let Apache Corp turn this special place into an oil and gas field. I don’t see how they can do whatever they want wherever they want? Who is letting them do this? Our representatives? If that’s the case, are they not to listen to their constituents. Recall them, seriously now. RECALL THEM. SMH! We need smarter voters in Texas.